Note: I am totally ripping this off and republishing from Navdeep Singh Dhillon as published on Quiet Revolution. Me, bottom left, shooting Ra Ra Riot in Chicago in 2015. Because it’s vaguely related to this post (being introverted in a traditionally “extroverted” setting). All text below by Navdeep Dhillon. Introvert-extrovert labels have always intrigued me because I grew up in a house of introverts, where quietness was an essential part of the day. Yet we did plenty of things attributed to extroverts, like attending parties every week, having a house full of guests over the holidays, and going on road trips with other families and random friends of my parents. There was always down time built into our days and nights. In high school, I assumed I was an extrovert because of all the tell-tale signs of things extroverts are supposed to enjoy based on the highly inaccurate and oversimplified checklist I used to self-diagnose. I enjoyed things extroverts are presumed to like that introverts supposedly don’t: playing sports, spending time with other human beings, going to crowded places like the mall, doing loud things like attending musical concerts and parties. But at the same time, my personality seemed to be at odds with these things. There was always a caveat. I liked going to parties, but hated making small talk. I liked spending time with some people, but wanted my alone time. I liked martial arts, but hated having to perform in front of the class for promotions. I wrongly thought I must just not like these activities. I had neglected to take into account that introverts have a different approach to things like parties and learning sports than extroverts might. Here are a list of five things I especially enjoy that are sometimes viewed as exclusive extrovert territory, yet can be very easily enjoyed by introverts without even much tweaking. I grew up being enthralled by martial arts, primarily through Bruce Lee movies I watched as a kid. I’ve dabbled in kickboxing, kungfu, and recently capoeira, which all involve moving primarily by footwork: standing up, punching, or kicking. One of the things I really enjoy about this style is that you can have your alone time to just focus on repetitive movements, especially when using pads or heavy bags to practice. Ground fighting styles like Brazillian Jiu Jitsu, on the other hand, seem like they’d be an introvert’s worst nightmare,because the assumption is you need outward extroversion to engage. There is no alone work, barring warm ups; you are constantly drilling techniques or “rolling” with another person from the moment you step on the mats. When Renzo Gracie Jiu Jitsu in Jersey City opened up a few blocks from us, I had no intention of signing up, but my adventurous seven-year-old ambivert daughter had other plans. I wasn’t surprised she took to it, although was a little surprised she wanted to sign up for the entire year and loves it so much she practically lives there. I was also surprised by the amount of time you’re in your own head in Brazilian Jiu Jitsu. Once you learn a technique, it’s all about strategizing with your partner in order to pull off the move. I’ve been training for six months, and it is pretty impressive how few moves I can pull off given the amount I train. My daughter, on the other hand, can run circles around me without even thinking about the steps required. I fell in love with karaoke when I lived in China, where it is a very intimate affair with a few friends and private rooms. Karaoke in the United States, with big stages in rooms full of people, would terrify anyone not drunk. Or anyone who can’t sing (not that I have that issue, cough, cough). But there are plenty of areas in many cities that have genuine Asian style karaoke with small rooms and a handful of snacks to order from. My favorite joints in New York City are the ones that allow kids. My daughter loves randomly picking a song in a different language, while I stick to familiar classics that I can introduce her to: British punkrock from the 1970s. Don’t let Hollywood fool you into thinking this is extrovert territory. The best thing about it is that you’re supposed to be off-key, just like you’re not meant to be some classically trained singer when you’re jumping on the bed belting out lyrics to a song with your friends, or you’re in the car and your jam comes on. The best part is when you make mistakes and get out of tune or read the lyrics wrong! Fact: dancing is fun. While I prefer dancing at home with my kids, sometimes I am required to leave the house for adult social gatherings. I have exactly four moves I use at Punjabi parties that I learned when I was 13 and are still going strong. But there are plenty of venues for introverts to stomp those feet. If Salsa night or Bhangra night at a dance club are not your thing, there are plenty of other options. Many gyms offer dance classes as a form of exercise, rather than just the study of the dance technique itself. There are many forms of dance from all over the world you can learn at a dance studio, which used to be relegated only to professional dancers, that now even casual dancers can try out. In addition to classes like breakdancing, salsa, or ballet, in places with high numbers of immigrant populations, there are also some wonderful schools catering to the art from those communities, ranging from traditional Indian dances to African dances like the Soukoss rooted in the Congo. I’ve always wanted to learn traditional Indian dances like Bharat Natyam or Kathak, with incredible footwork, facial expressions, and intricate details. In many areas of New Jersey and New York with large Indian populations (especially South Indians) you can learn these forms at dance companies like Navatman. And many of these dance studios have their own themed nights emulating a dance club, except they’re with people you know and they end at a reasonable time, allowing you to get home at a reasonable hour and read that book! Family and Friends Road Trip! I find it sad when introverts buy into the notion they could never survive a road trip with other people, especially family and friends. Of course, if there are deep-seated feuds happening, introversion is going to be the least of your issues. I grew up all over the world, and every country we’d live in, there would always be roadtrips whenever there was a long weekend. In Nigeria, we’d visit waterfalls, in Dubai we’d go on camping trips on the beach or to see the dunes, and in the United States we went on a big fat extended family trip to visit three islands in Hawaii. It is definitely a challenge when extroverts don’t understand the need for introverts to be alone because it’s so ingrained in our culture that this is the behaviour of someone who is angry or sad or depressed, and it must be fixed immediately. So rather than putting ourselves in a situation where we have to justify ourselves, we carved it into the schedule. Chill time, however we decided to use that time, was not optional. Without it, it feels like you’ve been scheduled for five museum visits in one day! I once made the mistake of going on a dumpling crawl with someone I knew from work when I used to work at a company selling knives door to door (it did not go well). I got the idea from somewhere (I turned out to be wrong) that they knew what they were doing. The idea of a crawl sounded like fun – walking around exploring a city while stopping frequently to sample dumplings. It turned out to be planned with a very extroverted sense of fun in mind. There were long walks filled with awkward small talk and way too much food ordered at each dumpling joint, which gave rise to even more small talk. If Shakespeare had gone on that dumpling crawl, I’m pretty certain he would have centered his tragedies on food crawls. I can’t think of very many things worse than not being able to enjoy your food and being inconvenienced by needing to find something to say, over and over again. The dumpling crawls I subsequently planned, with my kids first and later with a select group of adults, took into top priority the enjoyment of maximum dumplings without too much time-wasting conversation. This is not to say we can’t have fun conversations, but there were no long walks, and definitely no long draining commute times! Leisure time activities are often pre-scripted as “introvert” and “extrovert” activities, as if extroverts can’t enjoy a quiet evening at home with a glass of wine and a book, or an introvert couldn’t possibly go dancing because of the loud music and people. While extroverts can spend hours surrounded by people, going from one activity to another, without any people-break, and be totally sane afterwards, introverts like myself would end up eating somebody. Strategies are important. What are some of yours? Read the original on Quiet Revolution. This is an older talk, from 2013, but I loved seeing Karyn’s talk for Creative Mornings that discussed the value of adult play, providing some examples and play/art projects I hadn’t seen before, and especially in the Q&A section providing tips on how to become a play advocate in your 9-5 corporate job. Thank you to Creative Mornings for capturing this talk and sharing it publicly for everyone. The 30-Day Tree Climbing Challenge is on! I don’t normally promote my husband Rafe Kelley’s work with Evolve Move Play all that much, but this challenge is too good to pass up. Starting on Arbor Day (but you can really start any time), Rafe is inviting people to climb a tree for 30 days, and tag their friends to climb three trees or donate to the Arbor Day Foundation, or plant a tree! Use the hashtag #treeclimb30 to tag your posts. This is an international push, bringing in participants from Europe as well, including certified Evolve Move Play (EMP) coach Ben Medder, based just outside of London (UK). So get out there, climb a tree (or plant a tree), tag a friend, and get moving! In some ways this seems like an overly obvious, unnecessary post. Of course parents play fight with their kids! Right? Yet I am surprised by how few MOMS play fight with their kids. I do. And I love it! I didn’t think I would enjoy it as much as I do, but I do. Here are my top reasons why. 1. It teaches them body awareness – How hard do I have to push to make something happen? How strong am I before I get pushed over? How do I get myself back upright? How hard is too hard to hit? Also being aware of how strong they are now versus a month from now is important too as they grow and get bigger and stronger; I’ve known too many bigger little kids that don’t know their own strength. 2. It teaches them spatial awareness – How far away is that body I am playing with? Where are my legs and arms while I’m wrestling? Oops, now I’m upside down, how does that make me feel? 3. It makes them feel loved and given attention. 4. It’s fun! I’ll bet almost everyone at one time or another has played slug bug, tickle time, or wrestled with your sibling, or started a real fight with your sibling that by the end you two were both on the floor laughing. 5. They feel safe acting out being big and strong and knocking me down or punching me and knowing that I can take it. 6. Kids who play fight with their dads are being shown that men are big and strong. For somewhat feminist but mostly totally selfish reasons, I want them to know that women (i.e. ME!) can be big, strong, and tough too. 7. Along those same lines, grown-ups who play fight with kids are demonstrating that when people play or play fight, they are being respectful of each other’s boundaries, and if you don’t feel safe you can and should ask the other person to stop. If the other person doesn’t respect your boundaries then kids learn that’s not okay and they get time out or kids or grown-ups stop playing with them. This is a super-critical skill that is missing in so much rhetoric, both physical and verbal, in our society today. 8. As their mom, it is so fun to watch my kids get stronger, faster, more coordinated, and more creative in their physical play. They mix strategies, including saying silly things to catch me off guard, which is all part of the art of play. 9. Finally, I want to promote physical play of all kinds with kids and grown-ups alike. Whether that’s boxing, hiking, jump rope, tricycles, making forts, tree-climbing, or just going for an exploratory walk around the neighborhood, I support it. I’m sure there are other reasons I’m forgetting, but those are my main ones. My husband teaches natural movement classes, and before that parkour and martial arts. Slowly more women are joining the adult classes in all of those fields. But especially in the kids’ classes, the moms are just as likely to join their kids, but almost none participate given the opportunity. Why?! Some women (and men) don’t like physical contact activities. And that’s totally fine. But more often than not women are intimidated. I say no more fear! Get in there and push someone. Why do you play fight with your kids? Or why don’t you? Leave your thoughts in the comments below. 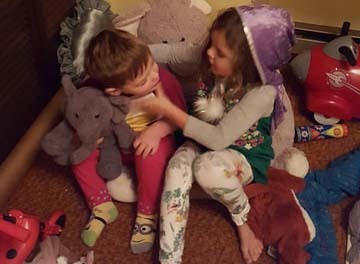 UPDATE: I wrote a follow-up post about safe ways to roughhouse with your children that you can find here.